In some people, the forehead and eyebrows relax and droop before your eyelids or face will. This is due to many factors including genetics, diminished elasticity from sun damage, or excessive movement of the forehead muscles. Natural aging and the pull of gravity can also cause frown lines and wrinkles to develop across your forehead. Other causes of brow ptosis include facial palsy, tumors, and asymmetry. Forehead muscles are used frequently in your facial expressions when you do things such as squinting, showing surprise, frowning, laughing, concentrating, talking, or during angry moments. As the muscles beneath your forehead move, the skin and tissues repeatedly fold, wrinkle, and stretch. As a result, your eyebrows fall into a lower position, especially on the sides, and your eyebrows droop, allowing skin to be pushed onto your upper eyelids. This gives them the appearance of having excess skin. When Dr. Moelleken performs a Brow Lift, it will correct the sagging forehead skin and brows that hang low and too close to your eyes. A common cosmetic surgery for the face, a Brow Lift will also correct the deep vertical furrows between your brows. If you would like to learn more about the procedure, please schedule a consultation with Dr. Moelleken today and he will take the time to evaluate your situation and together you can decide on the most optimal outcome. Basically, what Dr. Moelleken will do is lift your eyebrows through the side or center of your eyebrows. This will counteract the drooping that has occurred over the years as well as correcting the heaviness that has developed in your upper eyelids. Lifting your eyebrows to a normal position will open your eyes making you look alert and rested. A small amount of eyebrow elevation will make a remarkable improvement in your appearance and because of the new technical advances; a Brow Lift is an extremely popular cosmetic surgery procedure used to rejuvenate your face. If you have a sagging forehead or brows that hang too low, you may be a candidate for Brow Lift surgery. At Neo Surgery Center we know how important it is for you to feel good about yourself. Being confident has as much to do with how you feel on the inside as it does with how you look on the outside so whether you are looking for a subtle or noticeable change, call today and let Dr. Moelleken help you regain your self-esteem. At Neo Surgery Center, please remember that your relationship with Dr. Moelleken does not end when you leave the operating room. You will return to his office for follow up care at prescribed intervals, at which time your progress will be carefully evaluated. As always, if you have questions or concerns during your recovery, or you need additional information anytime, we are always available so please call. The results of your Brow Lift will depend on your appearance prior to the surgery as well as the specific goals and realistic expectations you have established. Since the healing process is gradual, you should expect to wait several weeks for an accurate picture of your refreshed, new look. Your brow, which includes your forehead and eyebrows, is an extremely important cosmetic part of your face. As you age, the anatomic changes that occur in your upper face associated with aging include; brow ptosis or the descent or drooping down of your eyebrows over the orbital rim, the hooding of eyelid skin over your lid shelf where your eye shadow is worn, increasing horizontal wrinkles that are a result of contracting the muscles that lift your eyebrows, and vertical lines between your eyebrows that occur when you make frowning expressions. The lines that develop across your forehead as well as on the bridge of your nose are known as frown lines and they are a very unwelcomed presence. These changes become more profound with age because your skin loses its elasticity and the effects of gravity and facial expressions take their toll. More than just making you look older, an aging forehead, sagging brows, and deep creases can also make you appear tired or sometimes even angry. Many times, people focus more on their eyelids and lower face thus overlooking how aged and tired a sagging forehead can make them look. Your face portrays the first visible signs of aging and your brow and upper face are a representation of your overall well being. When the graceful arch of your eyebrows change to one that is flat and heavy, it is time to research the options available and one way to correct your cosmetic concerns is with a Brow Lift. Also known as a Forehead Lift or Browplasty, Brow Lift surgery will create a fresher, more youthful look to your forehead and upper eye area. By tightening your skin, this procedure minimizes forehead wrinkles and drooping eyebrows. It can also elevate an eyebrow that may obstruct vision and remove the deep worry lines that run across your forehead. People considering a Brow Lift feel that their facial features do not reflect their youthful spirit and they are looking for a way to rejuvenate their appearance. If you have been struggling with a sagging brow, Dr. Brent Moelleken M.D., F.A.C.S., can turn back the hands of time with a Brow Lift. Literally, this procedure can consist of a small incision at the front of your hairline to slightly elevate the outer part of your brow. 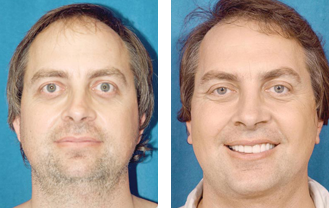 Many women and men who visit Dr. Moelleken at Neo Surgery Center feel that their face has taken on a fatigued look because their upper facial skin has started to deteriorate. Many patients also mistakenly believe they need a facelift when in fact; they may need a Brow Lift instead. 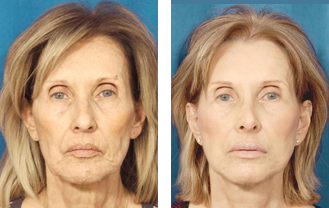 A facelift corrects the visible signs of aging in the lower face but does not rejuvenate the upper face. A Brow Lift is a surgery that raises drooping eyebrows and forehead skin into a more youthful position and as the name implies, your brow is lifted and your forehead skin is tightened. This will smooth out horizontal lines and minimize the heaviness in your upper eyelids.